One of the most powerful earthquakes ever recorded in Mexico struck off the country’s southern coast, toppling hundreds of buildings, triggering tsunami evacuation960 people were reported killed. The furious shaking created a second national emergency for Mexican agencies already bracing for Hurricane Katia on the other side of the country. The system was expected to strike the Gulf coast in the state of Veracruz early Saturday as a Category 2 storm that could bring life-threatening floods. The worst-hit city appeared to be Juchitan, on the narrow waist of Oaxaca known as the Isthmus. About half of the city hall collapsed in a pile of rubble and streets were littered with the debris of ruined houses. Local officials said at least 17 of the 35 dead were in Juchitan. Mexico’s capital escaped major damage, but the quake terrified sleeping residents, many of whom still remember the catastrophic 1985 earthquake that killed thousands and devastated large parts of the city. The earthquake hit off of Chiapas’s Pacific coast, near the Guatemalan border with a magnitude of 8.1 -equal to Mexico’s strongest of the past century. It was slightly stronger than the 1985 quake, the U.S. Geological Survey said. Oaxaca state Gov. Alejandro Murat told local news media that at least 23 people had died in his coastal state. Officials said at least 10 died in Chiapas and two others in the Gulf coast state of Tabasco. The quake struck at 11:49 p.m. Thursday (12:49 a.m. EDT; 4:49 a.m. GMT Friday), and its epicenter was 102 miles (165 kilometers) west of Tapachula in Chiapas. It had a depth of 43.3 miles (69.7 kilometers), the USGS said. Chiapas Gov. Manuel Velasco said that three people were killed in San Cristobal, including two women who died when a house and a wall collapsed. Tabasco Gov. Arturo Nunez said one child died when a wall collapsed, and an infant died in a children’s hospital when the facility lost electricity, cutting off the ventilator. The Pacific Tsunami Warning Center said waves of 3.3 feet (1 meter) above the tide level were measured off Salina Cruz, Mexico. Smaller tsunami waves were observed on the coast or measured by ocean gauges elsewhere. The center’s forecast said Ecuador, El Salvador and Guatemala could see waves of a meter or less. No threat was posed to Hawaii or the western and South Pacific. Authorities briefly evacuated a few residents of coastal Tonala and Puerto Madero because of the warning. The new quake matched the force of a magnitude 8.1 quake that hit the country on June 3, 1932, roughly 300 miles (500 kilometers) west of Mexico City. Death Toll Rises in Powerful Mexico Earthquake. The quake hit minutes before midnight Thursday. 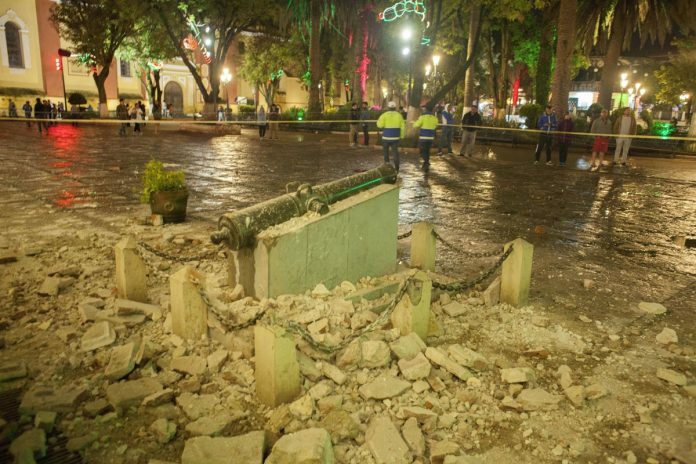 The worst-hit city appeared to be Juchitan.